Convert a LabelMap to a binary image. LabelMapToBinaryImageFilter to a binary image. All the objects in the image are used as foreground. The background values of the original binary image can be restored by passing this image to the filter with the SetBackgroundImage() method. Definition at line 45 of file itkLabelMapToBinaryImageFilter.h. Definition at line 55 of file itkLabelMapToBinaryImageFilter.h. Definition at line 70 of file itkLabelMapToBinaryImageFilter.h. Definition at line 61 of file itkLabelMapToBinaryImageFilter.h. Definition at line 63 of file itkLabelMapToBinaryImageFilter.h. Definition at line 60 of file itkLabelMapToBinaryImageFilter.h. Definition at line 62 of file itkLabelMapToBinaryImageFilter.h. Definition at line 58 of file itkLabelMapToBinaryImageFilter.h. Definition at line 64 of file itkLabelMapToBinaryImageFilter.h. Definition at line 67 of file itkLabelMapToBinaryImageFilter.h. Definition at line 69 of file itkLabelMapToBinaryImageFilter.h. Definition at line 66 of file itkLabelMapToBinaryImageFilter.h. Definition at line 68 of file itkLabelMapToBinaryImageFilter.h. Definition at line 59 of file itkLabelMapToBinaryImageFilter.h. Definition at line 54 of file itkLabelMapToBinaryImageFilter.h. Definition at line 52 of file itkLabelMapToBinaryImageFilter.h. Definition at line 53 of file itkLabelMapToBinaryImageFilter.h. 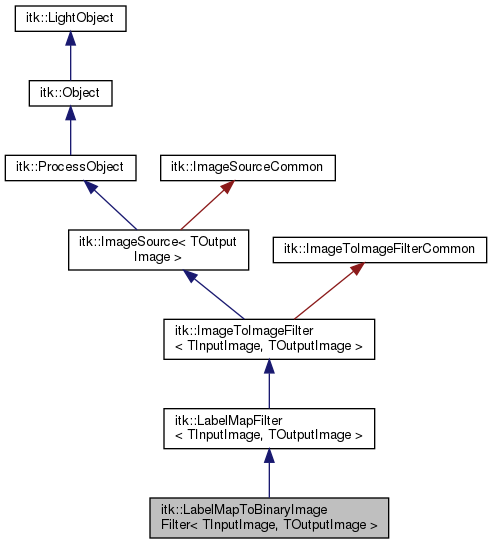 Reimplemented from itk::LabelMapFilter< TInputImage, TOutputImage >. LabelMapToBinaryImageFilter will produce the entire output. LabelMapToBinaryImageFilter needs the entire input be available. Thus, it needs to provide an implementation of GenerateInputRequestedRegion(). Definition at line 106 of file itkLabelMapToBinaryImageFilter.h. Set/Get the value used as "background" in the output image. Defaults to NumericTraits<PixelType>::NonpositiveMin(). Set/Get the value used as "foreground" in the output image. Defaults to NumericTraits<PixelType>::max(). Definition at line 100 of file itkLabelMapToBinaryImageFilter.h. Definition at line 112 of file itkLabelMapToBinaryImageFilter.h. Definition at line 118 of file itkLabelMapToBinaryImageFilter.h. Definition at line 140 of file itkLabelMapToBinaryImageFilter.h. Definition at line 73 of file itkLabelMapToBinaryImageFilter.h. Definition at line 150 of file itkLabelMapToBinaryImageFilter.h. Definition at line 151 of file itkLabelMapToBinaryImageFilter.h. Definition at line 74 of file itkLabelMapToBinaryImageFilter.h.